Dr. McGregor was born in Montreal and following a BSc. in Biology-Chemistry from Loyola College, she received her DDS from McGill University in 1974. She took to heart the Dean’s parting message to her about “Daily Knowledge” and has been committed to lifelong learning. Catherine spent ten years searching and studying in the fields of craniofacial pain, dentofacial orthopedics and sleep disorders, culminating in earning Fellowship in the American Academy of Craniofacial Pain in 2007, and then in 2009 establishing the TMJ & Sleep Therapy Centre of Eastern Ontario, following the protocol established by the Founder, Dr. Steven Olmos, of San Diego. Some of the organizations that Dr. McGregor is a member of include The Canadian Sleep Society, The American Academy of Craniofacial Pain, The American Academy of Dental Sleep Medicine, the International Association for Orthodontics, and The Canadian Dental Association. Dr. McGregor is a founding member of the Canadian Chapter of the American Academy of Craniofacial Pain, and currently serves as the President Elect. She also leads several study clubs in her area, the Eastern Ontario/Northern New York Study Group, and the Rideau/1000 Islands Study Group. 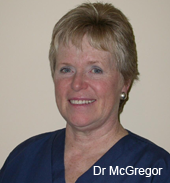 Dr. McGregor also enjoys speaking to the public or groups of professionals on various topics in her chosen field. Dr. McGregor and her highly skilled staff are dedicated to giving their patients a thorough assessment, accurate diagnosis and compassionate treatment that sometimes involves referrals to other healthcare professionals. Expect quality care in a caring environment. "What IS TMJ Therapy Centres International ?" Sun 7th February 2016 to members of the Granite Curling Club. Noon till 1 pm. Light lunch provided.